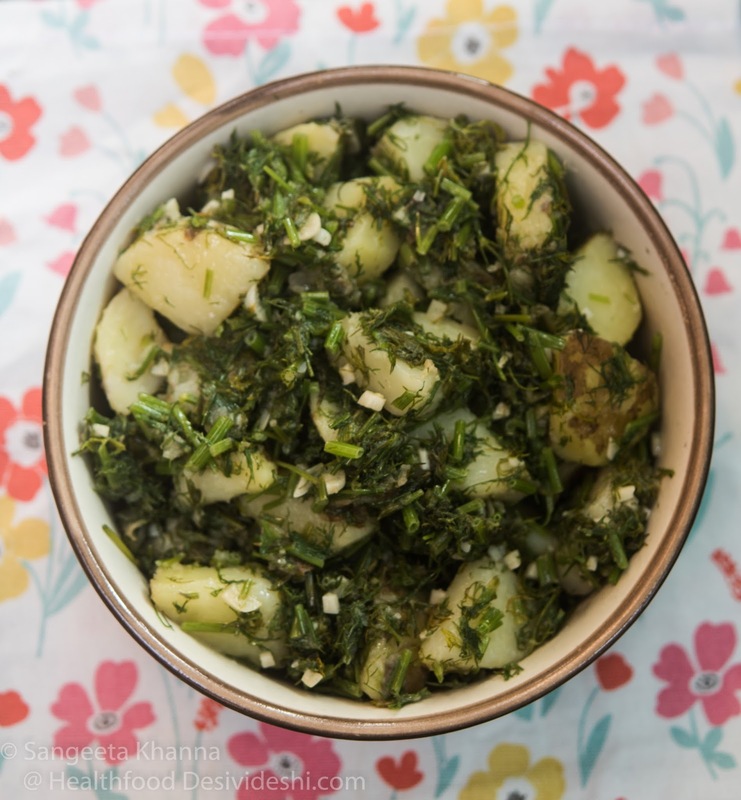 Potato and dill salad with sesame oil and garlic can become your favourite if you like the flavour of dill. The potatoes get infused with the aroma of dill and garlic with the oil or your choice. I make this salad with sesame oil or mustard oil when we are planning to eat it cold and in butter when we have to have it hot or warm. Dill and garlic both combine really well despite seemingly opposite set of tasting notes, potatoes actually help to bring together the sharpness of raw garlic and the sweetness of dill. Very few people don't like dill but when mixed with fenugreek leaves it gets a more complex flavour and it becomes acceptable even for the dill haters. Do try dill and fenugreek leaves together sometime, it is a popular combination of herbs in UP. Potatoes are considered bad for the weight watchers due to the carbohydrates they pack in but many of us forget that potatoes have resistant starch and quite low glycemic too. Apart from this, potatoes pack in a helpful amount of potasium, helpful for hypertensive folks. I avoid potatoes during summer months because they taste horribly sweet and have no texture but the winter potatoes (new potatoes) are a delight to cook with. Since the husband loves potatoes I make it a point to get a big sack of potatoes from our weekly vegetable market. These days I have been making a lot of potato salads for his lunch box as there are other winter vegetables to add to the potato salad. His most favourite is Italian potato and beans salad that I now cook a bit differently and the potato and dill salad comes quite close. Since I have to cook for the lunch box in the morning and I am not a morning person, I have found really quick ways to fix these salads for him, often using pressure cooker. Scrape the potatoes if needed, I like keeping the skin on if the skin is unblemished. Cut the potatoes in bite size cubes. halve the baby potatoes if using those. Rinse and transfer to a pressure cooker pan, add salt to taste and 1/4 cup of water. Close the lid and pressure cook till the first whistle blows. Lower the heat, wait for 2-3 minutes and switch off the gas. let it cool so it can open on it's own. Clean and rinse the dill leaves in the meanwhile. Chop them fine on a chopping board by holding the bundle tight with one hand. I get the vegetables and greens chopped by my help so it gets easier for me in the morning. Once the cooker is cool, open the lid and drain the leftover water holding the lid loosely as you tilt the cooker over sink. Making things quicker means you have to let go of the strainer and perfect drainage of water, don't worry if some starchy water is left in the cooker. It helps. Now pour the sesame oil in the cooker with potatoes which is still hot. 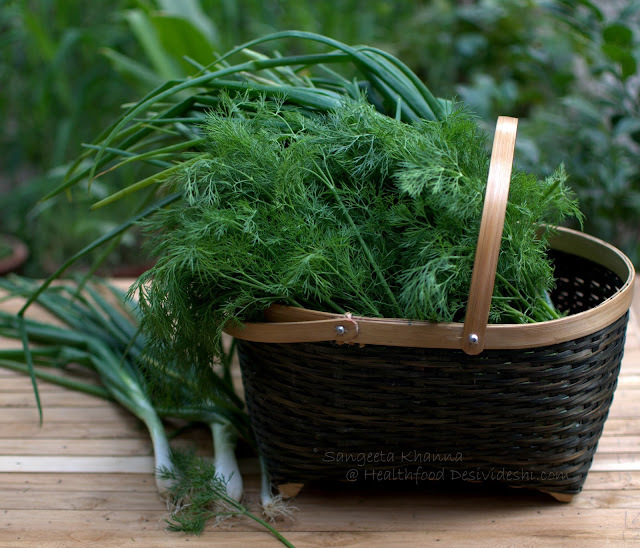 Dump the garlic and dill leaves, adjust salt and add pepper too. Toss to mix over high heat, let it sizzle just for two minutes as you feel the aroma filling the entire home. Switch off the gas and keep the lid closed for a while. Pack in lunch box or serve hot or cold as required. Note that dill leaves are also a good source of potassium apart from other minerals and antioxidants so this salad makes a good meal for those who are trying to lower their blood pressure.